Esteemed researchers have concluded that if one is to stay healthy, one must not only make a few healthy choices, but must ultimately live an overall healthy lifestyle. To be truly effective, healthy living must be broadly embraced. For example, you may prioritize your skin’s health by receiving regular facials, but then do your skin serious disservice by exercising poor dietary choices. Each choice we make with regards to our bodies relates to every other choice we make. When it comes to protecting your skin against blackheads and blemishes, it’s important to view your skincare approach holistically. Realizing that everything from your diet and exercise regimen, to your choice of face wash, will affect your skin’s health, is the first step to ensure you remain free of blackheads and blemishes. To determine which new healthy choices may benefit your skin, please consider the following five ideas. From food to face wash, your new mantra should be “Natural is better.” While technological advances have improved our society in many ways, the purest forms of nature still provide us with the clearest path to health and wellness. Some manufactured chemicals may help to treat chronic acne, but the best way to prevent blackheads and blemishes is found in whole foods and natural beauty products. When it comes to diet, whole foods are almost always best. If your great-grandparents wouldn’t recognize something you consider eating as “food,” then choose something else to snack on. Processed foods affect your skin in a variety of ways and can ultimately imbalance your skin to the point where breakouts occur. When you eat a varied diet of whole foods and drink plenty of water, you give your skin the best chance of remaining clear. 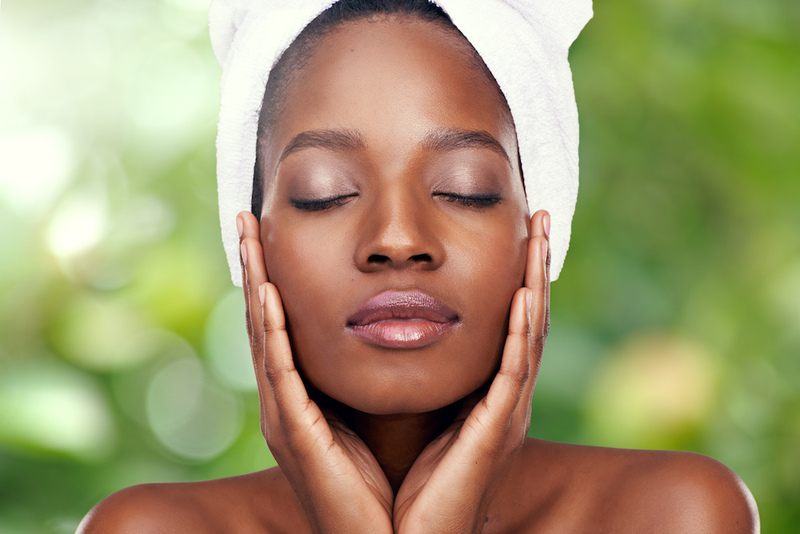 When choosing skincare products, aim to purchase washes, moisturizers, scrubs, oils, gels, creams, serums and masks that feature natural ingredients. Natural face wash and moisturizer help maintain clear skin, while natural spot treatments, gels and masks help ensure the effects of occasional breakouts are minimized without upsetting your skin’s delicate balance or causing it damage. Natural face washes laden with a host of manufactured chemicals can cause acne to worsen, strip skin of its protective lipid layer and cause irritation. Natural face washes are gentler on your skin and provide benefits found only in nature. Thus, natural cleansers tend to leave your skin free of inflammation and irritations. Therefore, with few exceptions, natural cleansers are the best option for sensitive skin prone to breakouts. A study published in Sleep indicates that for every hour of recommended sleep lost each night, your risk of suffering from psychological stress increases by 14%. This is significant because stress affects hormone production, which in turn affects skin health. When you fail to obtain needed sleep and relaxation, you risk breakouts. This is an example of how healthy lifestyle choices overlap and inform one another. Even if you’re eating well and using natural skincare products, you’ll risk breakouts if you don’t allow your body to rest and recuperate from the stress of your daily life. Before you go to sleep, make sure you’ve cleansed your face with a natural acne face wash or other natural cleanser, and make sure your hair is pulled back if it’s coated with unnatural products. The products you use in your hair can be absorbed into your skin while you sleep, so take care to either keep your hair off your face or to use natural hair care products that won’t irritate your skin. Also, try to ensure your bedroom is cool, dark and free of distracting noise. The quality of your sleep affects your potential stress levels and associated breakout risks. Because stress can disrupt your hormone balance and make you more prone to breakouts, it’s important to address stress in various ways. In addition to making sure you get adequate rest and incorporate relaxation into your daily routine, it’s also important to exercise regularly. Exercise is a proven stress-reducer, especially when you find a form of exercise that you enjoy. Hate running? Try Zumba. Cringe at the thought of sweating through your clothes? Jump in a pool and swim laps. Don’t have access to a gym? Check out workout videos on YouTube or simply walk around your neighborhood. If the thought of your chosen exercise routine causes you stress, your skin might suffer. Finding exercise routines that you enjoy will help reduce this risk. When done exercising, consider showering or rinsing off your face. Some skin types are irritated by prolonged exposure to dried sweat. Rinsing or naturally cleansing your sweat can help prevent breakouts on your face and body. How many times each day do you touch your cellphone? Every time you text, check your email, access the Internet, play games and make calls, you touch your cellphone’s screen, and each time you do so, you transfer germs from your fingers (and anything you have recently touched) onto its surface. When you make a call and place your cellphone to your ear, those germs transfer to your skin. It’s easy to understand why this daily routine causes breakouts. Cleaning your cellphone’s screen regularly helps prevent them. Film legend Baz Luhrmann has famously mused that “If I could offer you only one tip for the future, sunscreen would be it.” Wearing sunscreen will not only keep your skin looking youthful and help prevent skin cancer, it will also keep your skin clear. Some people avoid sunscreen because they’re worried it’ll clog their pores, however, sunscreen prevents UV-related inflammation, which worsens breakouts. If your skin reacts negatively to one brand of sunscreen, seek out another natural brand specifically made for sensitive skin.